Before reaching the chilling winter season, I like to share with you my recipe for a homemade chicken broth. Up until about 2 years ago I used to use organic store bought chicken broth in soups. One time I decided to take a look at the list of ingredients on the box, and along the normal ingredients (organic chicken, water, celery,...) I found some mystery items as well, like organic "flavorings" or organic "yeast extract". I thought that offcourse they would need some mystery ingredients in their nicely packed chicken broths, afterall how could they manage to keep them "fresh" on the store shelves for a year. So I started to make my own broth. It really doesn't take much of my time. I make 2 to 3 batches per year and I have my year's supply of chicken broth saved in the freezer. Use a kitchen twine tie the herbs together. Place the chicken, onion, celery, carrot, garlic, herb bundle, and seasonings in a large stockpot. Add about 2 1/2 quarts of water and bring to a boil. Simmer, uncovered, for 1 1/2 to 2 hours. Strain the entire contents of the pot through a colander and discard the solids. You can save the chicken for something else. Chill the broth overnight. The next day, remove the fat from the surface. Use immediately or pack in containers and freeze for up to 6 months. 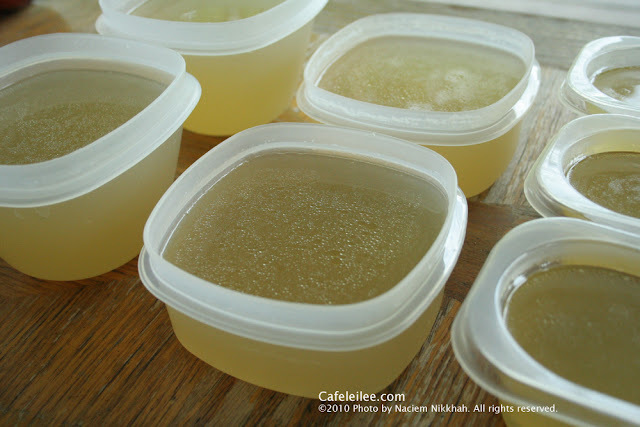 Tip: I like to pack my broth in different size containers, so I don't have to melt a large one when I only need one or two cups. حالا که داریم به فصل سرما و در نتیجه سرماخوردگی و آنفلونزا نزدیک میشیم (بلا به دور) تصمیم گرفتم که دستور آب مرغ خونگی رو براتون پست کنم. من تا حدود ۲ سال پیش آب مرغ طبیعی که از بیرون میخریدم رو استفاده میکردم تا اینکه یک روز روی جعبه رو خوندم و در کنار مواد عادی مثل مرغ، هویج، کرفس، یک سری مواد دیگه رو هم دیدم که تو عمرم اسمشون رو نشنیده بودم. با خودم فکر کردم که همینه که این آب مرغ ها یک سال تموم توی طبقه مغازه دووم میارن. از اون به بعد تصمیم گرفتم که خودم آب مرغ رو درست کنم. سالی ۲ تا ۳ بار آب مرغ درست میکنم و برای یک سالم آب مرغ تو فریزر دارم. مرغ، پیاز، کرفس، هویج، سیر، سبزیها، نمک و فلفل را توی یک قابلمه بزرگ بگذارید. و روی مرغ را با حدود ۲ لیتر و نیم آب بپوشانید و به جوش بیاورید. در قابلمه را بردارید و بگذارید آرام آرام برای یک و نیم تا دو ساعت بجوشد. مرغ را از قابلمه خارج کنید و آب مرغ را از صافی رد کنید و شب تا صبح تو یخچال بگذارید. روز بعد چربی روی آب مرغ را بردارید. اگر آب مرغ را همان موقع استفاده نمیکنید، توی ظرفهای مناسب بریزید و فریز کنید. نکته: من معمولا آب مرغ را توی ظرفهایی به اندازه متفاوت میریزم تا مجبور نشم یک عالمه آب مرغ را برای ۱ تا ۲ پیمانه آب کنم.